Kara Dawson is the College of Education’s newest Irving and Rose Fien Professor. 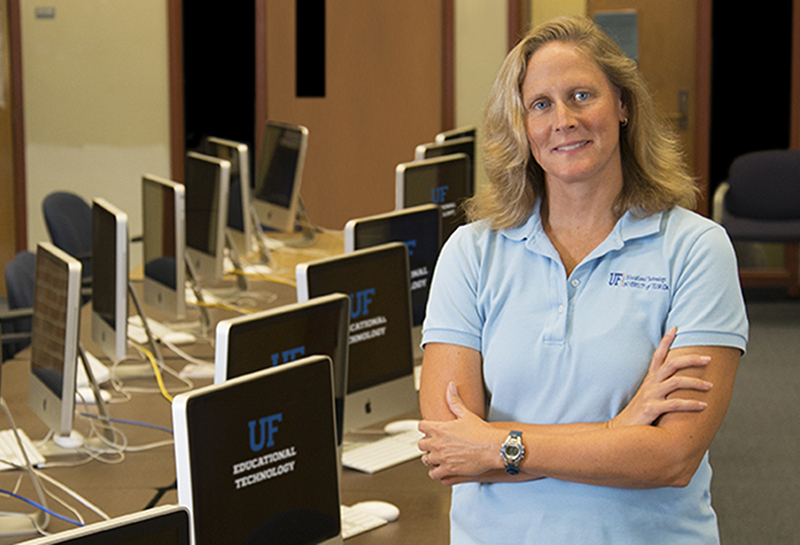 It was in 1990 when Kara Dawson gained an insight that was to become the central focus of her research career as a professor of educational technology. Back then she was teaching 5th, 6th and 7th graders in Virginia Beach, Virginia, at a time when personal computers were just catching on and the invention of the first internet browser was three years away. Dawson attended a workshop on authoring software and began experimenting with using technology in her classroom as a way to engage struggling students. Kara Dawson received the College of Education’s Irving and Rose Fien Professorship for 2015-2018. Creating a network of teacher fellows to engage in a study of technology practices in classrooms. Coordinating an annual interactive lecture series on the topic to connect a community of interested individuals. Supporting doctoral students interested in this area through travel funds and other opportunities. She soon came to see that educational technologies could improve the learning outcomes for virtually all students. 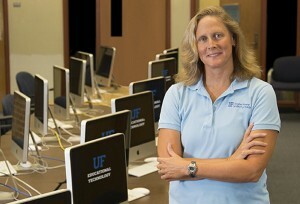 She became her school’s technology integration specialist and in 1994 she returned to college to earn a doctorate in the emerging field of instructional technology from the University of Virginia. Last year, the College of Education’s Research Advisory Committee selected Dawson as its Irving and Rose Fien Professor. The three-year post supports veteran faculty members with a track record of successful research aimed at helping at-risk learners in kindergarten-through-high school, mainly at high-poverty schools. Recently, Dawson took time to discuss her research and the ways incorporating technology and digital tools into traditional classrooms can help all types of learners to flourish. Below are excerpts. Q: Can technology help students who struggle in traditional schools? A: Yes, particularly if they are bored, not engaged or struggling to learn content. In schools, we are very limited in how we think about success and the way that students can access content and show what they know. We are also limited in the ways we think about how we teach. These limitations are very real and exist for many reasons often outside the direct control of individual teachers and administrators. But we should keep thinking about how to make school better for all students. Technology is not going to be the end-all-be-all solution, but it can help a lot more than it is helping. Q: These multimedia tools may get them more engaged? A: Yes, but we need to figure out how to match technologies to students. And how to match students to technologies. More importantly, students have to be empowered to think about what works for them and to seek alternatives to support their learning now and in the future. Q: Can you provide examples of how technology can be useful in a classroom? A: Well, there are a lot of ways technology can be useful in the classroom. I have done quite a bit of work with whole class projects that help students become digital communicators, creators and collaborators. But these uses are different from thinking about how technology can meet individual needs. Two simple, readily available tools are: text-to-speech and speech-to-text apps. Q: With speech-to-text, you mean there is a web page or a textbook that is enabled to read the text to a student? A: Yes. For example, for a student struggling to get through a 40-page chapter on U.S. history, text-to-speech could be the difference between accessing the content or not. For another student listening to the chapter may simply be a preference rather than a necessity. But, the types and quality of the technologies available to these students as well as the mindset of their teachers determine whether they can use this feature. Unfortunately, many digital resources created for K-12 education are poorly designed (especially some digital textbooks) and some educators still view reading as the only way to access content. So, the apps may be simple but the context in which they need to be used is quite complex. Two other examples are speech-to-text and word prediction. I once taught a student who was very articulate but with horrible handwriting. Why not let him communicate his ideas through speech-to-text apps? Why not teach students who struggle with spelling (or really all students) how to use word prediction? Once again, these are simple apps, but the challenge is how do you bring them to the complex world of K-12 education. Q: Let me take a devil’s advocate position. How do you respond to those who say kids need to learn how to spell, that we shouldn’t have a tool to do it for them? A: Don’t get me wrong, it’s important that students to learn to spell. But not everyone is going to be good at it and this shouldn’t deter students from being able to communicate their ideas. It shouldn’t continually hinder them from succeeding in school, especially when the goal of a particular learning task may not be focused on spelling. Q: Is this a big debate in education, one with parents and others, that there is work to do to get this message out? A: There needs to be some empathy and understanding that being smart is not equivalent to being able to read and write. Think about it, students who struggle with reading, writing and spelling are essentially doomed in a school environment if learning every subject is predicated on these three skills. Imagine if we gauged how smart you were based whether you could communicate through song. And so everyone who had a good voice and was gifted in that way would shine. Or what if we communicated everything through drawing? So it’s just a very limited way we think about things. If a student cannot read well (or quickly) and all content is provided through a textbook then she will struggle to learn science and history even if she has innate strengths in other areas, such as the visuospatial strengths needed to succeed in science. Technology can level the playing field for these students. Q: As far as the Fien Professorship, what do you hope to accomplish over these three years? A: I really hope to make progress on the ways we can use technology to support the needs of all learners. I am involved with two studies about how nontraditional college students learn in multimedia environments. We hope to find out how multimedia and online environments can be modified to meet the needs of different kinds of learners and extend our work to K-12 students. One of the most exciting things is that these studies require interdisciplinary collaboration. We need the expertise of special educators, psychologists, computer scientists and neuroscientists. And, I get to work with closely the exceptionally smart colleagues in my own program as well — Albert Ritzhaupt, Pasha Antonenko, Carole Beal and Swapna Kumar. I also want to make an impact people’s awareness about how technology can meet the needs of all learners. In particular, I plan to work with and learn from teachers who are trying to figure out how to use technology to help their students and with preservice teachers. They have the chance to be leaders in their schools after graduation. And I’m working with a grassroots group of parents led by Blake Beckett (from P.K. Yonge, the College of Education’s developmental research school) to find ways parents can use technology to support their children. There are several potential funding sources to further this work and I’m looking forward to see where these ideas and conversations go. Q: Does it feel daunting with such a big subject? There seems so much to learn. A: I know I’m not going to solve it; there are so many folks from so many areas trying to make a difference for students. I want to do what I can do and try to make things better and connect with other people who are doing interesting work. I don’t consider it daunting because I’m not naïve enough to think it’s going to ever be completely solved but I want to make progress and be part of the solution.